Posted March 24, 2011, 1:41 PM. A fast-moving storm, the second of a young spring, blew through the region Wednesday night and early Thursday morning. Two more storms are due before the unsettled weather lifts early next week. Rain totals from the storm ranged from 0.27" in Riverside to 0.66" in Lake Elsinore. The rainfall forecast was for between a quarter and a half of an inch in the inland valleys. Scattered showers preceded the main front. Most of the rain fell in the evening hours, between 7:30pm and 11pm, with scattered showers lasting past midnight. Some communities had 0.01" for Thursday, and the rest had only trace amounts. Other significant totals were in De Luz (0.66"), Wildomar (0.56"), Murrieta (0.55"), Fallbrook (0.45"), Temecula (0.44") and Menifee (0.40"), as the storm favored the southern areas of the inland valleys. With the jet stream sagging south, two more storms were scheduled to arrive in Southern California by the end of the weekend. The next storm is predicted for tonight, and could add another quarter to a third of an inch to what has ended up being a wetter than usual March, the wettest since 2006. Another storm on Saturday night could add a tenth of an inch of rain. WeatherCurrents' San Jacinto site was in the middle of a prolonged outage and was not operational during the storm. 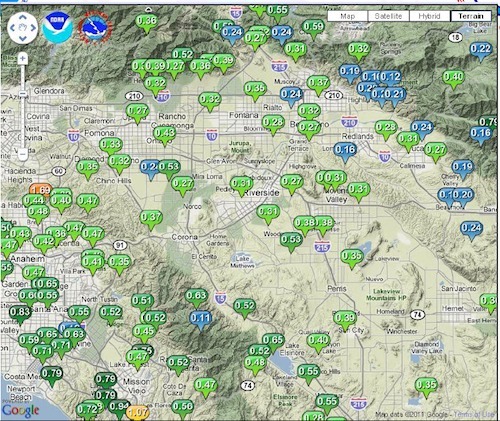 Moreno Valley storm totals are from a manual rain gauge.